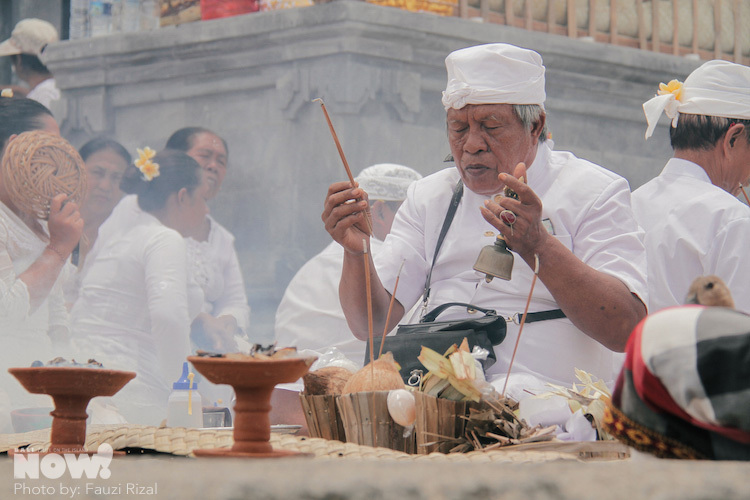 One of the precursors to Nyepi is the melasti ceremony, also known as ‘melis’. 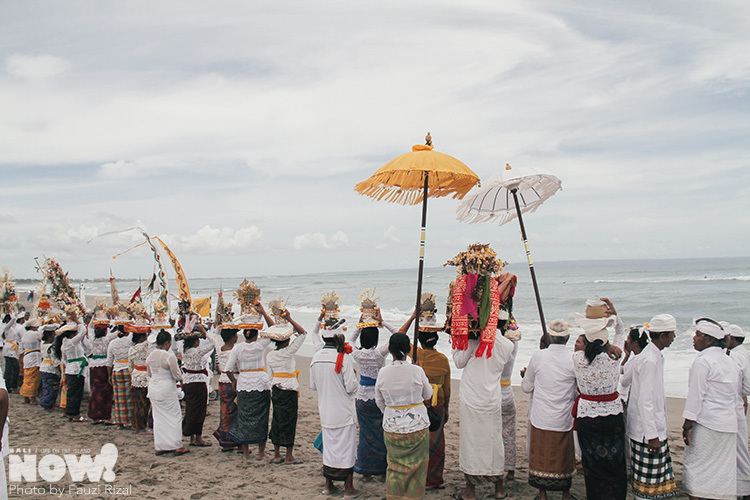 Whilst just as visually extravagant as a piodalan temple ceremony, melasti is of incredible importance to the annual (and sometimes more) rites of the Balinese Hindu. During this ceremony, lines and lines of local Hindus will journey to the sea or a holy spring for a special purification. As the term purification suggests, the goal of melasti is to remove impurities, but unlike the melukat ceremony it isn’t the ‘self’ that is being purified, but rather of a village, its deities (through their earthly representations) and other external components. 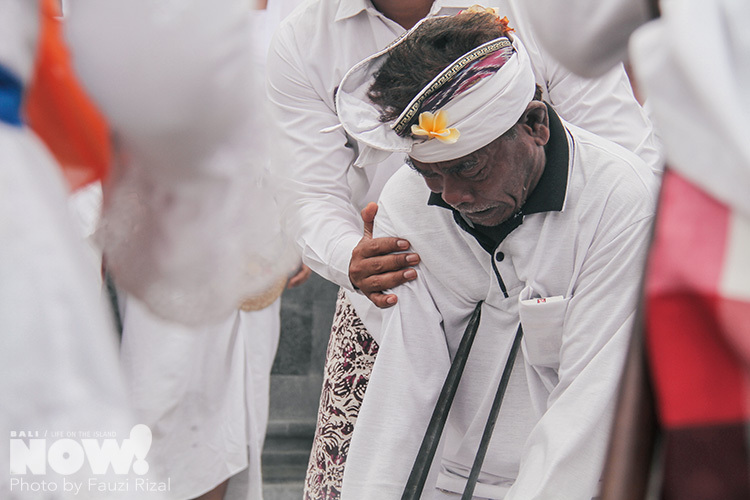 During melasti, village communities (or banjar) travel together to their closest source of holy water, to some this may be a holy spring, to others this is the sea. 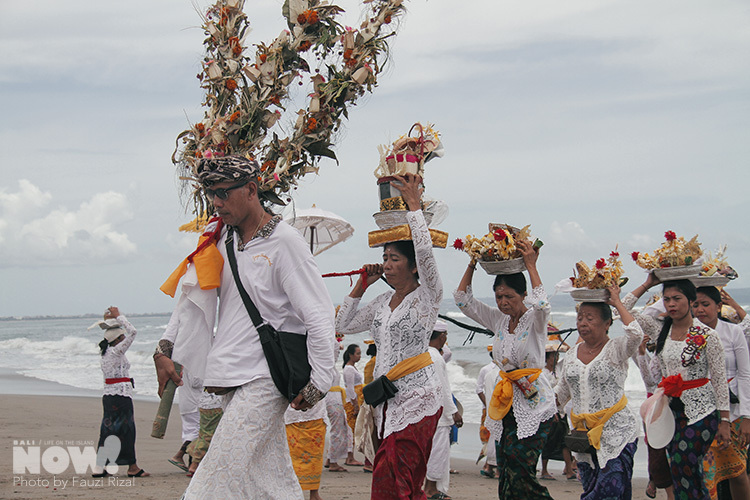 It’s hard to miss, as lines of ladies carrying offerings on their heads (a procession called ‘Mapeed’), men carrying the pratima shrines on their shoulders and others holding up Balinese umbrellas take to the streets and walk from temple or village to the coast. Or you may see them piled into trucks, dressed in their kebaya, sarongs and udengs, umbrellas poking out the top. In either situation, the Balinese gamelan orchestra are always nearby, the clangs, bangs and clashes adding to the atmosphere. At the beach, the pratima shrines and icons in which ancestral spirits reside (like the Rangda and Barong puppets) are laid down. Here the priest will pray and chant his mantras, flicking holy water, his flower and ringing his prayer bell. Around him, worshippers join in prayer too among other rites of worship from dance, to the ngeruk knife ritual; many fall into a trance (surupan) during such a holy time, as they are induced into a state that brings them closer to the deities. Why the beach or holy spring? Well, water is a cleansing element in Balinese Hindu belief, and the sea itself is a source of life – holding the essence of everlasting life, amerta. Thus, at the sea, the deities are refreshed and purified by the essence of amerta. Whilst yes, the melasti ceremonies are the blessings for the external, the symbols of ancestors, of good and evil, they at the same time purify the self. 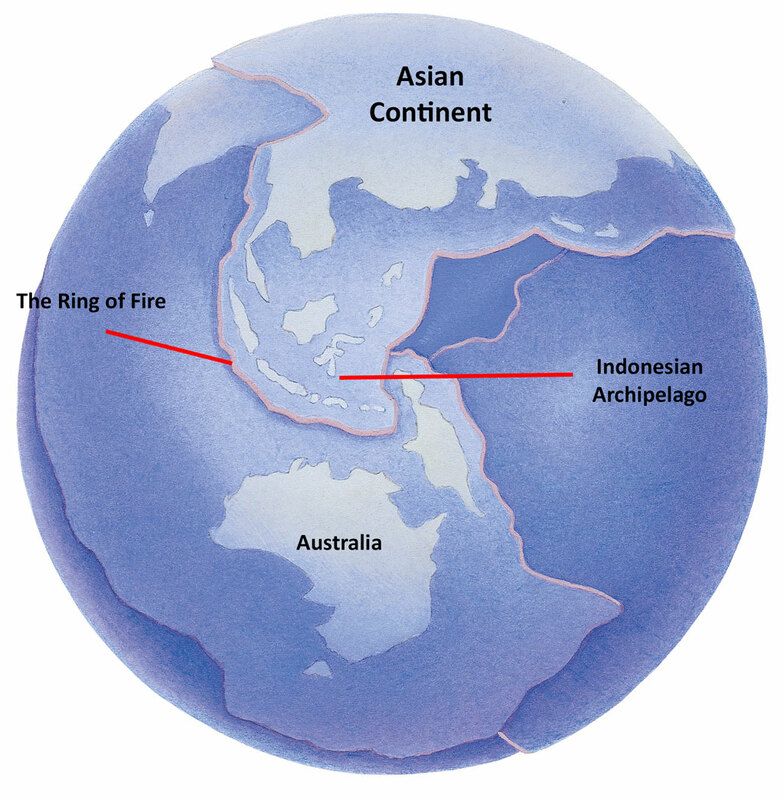 The blessed items are symbols of the cosmos, the universe, Bhuwana Agung (the larger world), whilst we humans are Bhuwana Alit (the little world). 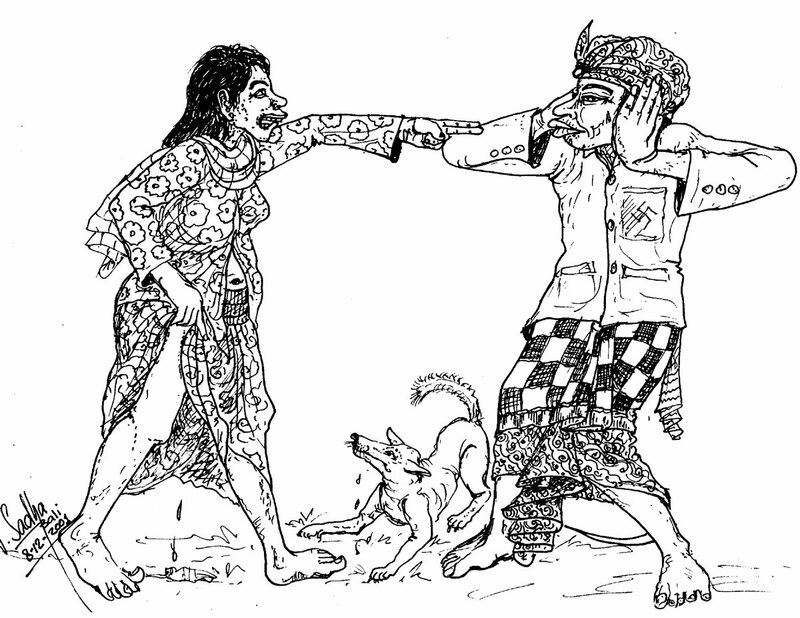 But a relationship exists within Balinese belief that Bhuwana Agung and Bhuwana Alit exist within one-another. So during melasti, both people and the world around them are purified, cleansed of bad thoughts, deeds and negative influences. So, before Nyepi (either 3 days before or sometimes just before the Ogoh-Ogoh parade), look out for a very special melasti ceremony !